The TROPOMI Aerosol Layer Height (ALH) product focuses on retrieval of vertically localized aerosol layers in the free troposphere, such as desert dust, biomass burning aerosol, or volcanic ash plumes in layers for cloud-free scenes. Applications include radiative forcing studies, long-range transport modeling and studies of cloud formation processes, and are of use for aviation safety. 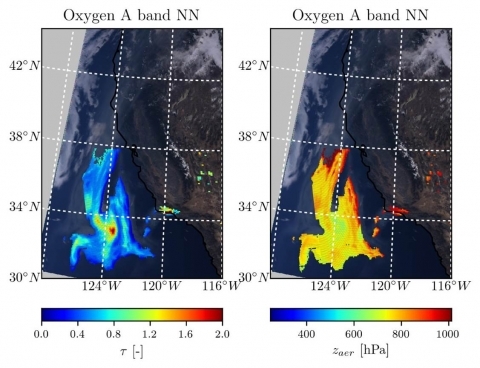 Retrieval of aerosol height is based on absorption in the O2 A band in the near-infrared wavelength range (759 and 770 nm). Currently the ALH algorithm is undergoing rigorous optimization and testing aimed at improving the speed of the retrieval. Results from the scientific, non-operational, TROPOMI ALH processor yield very promising results as shown in the figure below, for the California fires on 12 Dec 2017, with retrieved aerosol optical depth (left) and retrieved layer height in pressure units (right). Links to the Algorithm Theoretical Basis Document (ATBD) and the Product User Manual (PUM) are located on the right of this page under Documentation. This data product is planned for release in early 2019. Once released, the Product Readme files (PRF) will be made available here.